An ambitious effort to digitize 300 years of Serbian military records has led to the indictment of more than a dozen war criminals and the discovery of unmarked mass graves. The digitization of the Serbian Defense Ministry’s archives, which includes paperwork dating back to 1716, set out to spot war crimes. Now, a recently released paper by one of the project’s American funders, the Knight Foundation, claims that 14 paramilitary leaders responsible for the slaughter of civilians were indicted on war crimes charges thanks to evidence from the archive digitization. One of the major stories of the past week was the capture of Ratko Mladic, a Bosnian Serb responsible for the worst war crimes in Europe since World War II. Mladic, who was captured in northern Serbia, was responsible for the death of more than 8,000 Bosnian Muslims in what is known as the Srebenica Massacre. The digitization of Serbia’s military history has helped shed light on some of the darkest chapters in European history. Serbia’s location in the heart of the Balkan mountains has cursed it with a long, violent story of warfare within its borders: The nation saw vicious fighting in World War I, World War II, the Yugoslavian civil war, and the Kosovar conflict in the last century alone. While ambitious historic archive digitization, such as the the digitization of the Dead Sea Scrolls, has been around for a while, efforts in Serbia have often faced difficulty due to the country’s tumultuous history. Multiple wars, successive systems of government, and rapidly shifting borders have contributed to what is often a nightmare for many archivists. 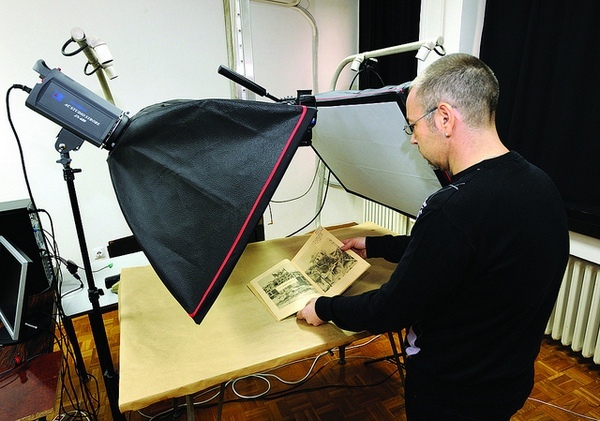 The Serbian digitization project was started with a $50,000 seed grant in 2006 from the Knight Foundation, and an archive digitization system was then designed for the Serbian government by the Jefferson Institute, a Washington-based non-profit “independent research and education institute” that works extensively in Serbia. The Knight Foundation took a huge social entrepreneurial risk, betting on what seemed like a crazy idea in 2006. It is a great story of how international development should work, but rarely does: We built a solution that the Serbia Ministry of Defense asked for and along the path of working with the brilliant innovators in this emerging democracy, we learned a lot that we are bringing home to help reinvigorate our own still young democracy. That is transformational return on philanthropic investment. The Serbian military archives are searchable by keyword via a proprietary interface that includes a detailed metadata schematic that can be annotated by researchers as they work for public viewing. Documents are coded into categories such as discharge papers, battle plans, memos, field maps, and military cables. So far, only 10% or so of the Serbian archives have been digitized: Archivists have been focusing their efforts on documents from the breakup of Yugoslavia and World War II, where combatants are likely to still be alive and the need for resolution and documentation the greatest. Peacetime digitizations are expected to follow the conflict scans; the collected documents were collated from multiple archives. According to a Knight Foundation report, the digitization also led to the discovery of unmarked mass graves belonging to prisoners executed by Marshal Tito’s secret police. When Dusan Vasovic, 75, visited the archives in 2010, he had no idea what he’d find out about his father. When his father died in 1973, his past was buried with him. “I was shocked when I saw my father’s name as one of the main figures in a coup” that changed the course of WWII history, Vasovic said. In Zarkovo’s files he learned his father, an army major in the Kingdom of Yugoslavia’s forces, was one of the senior officers who refused to go along with a secret pact signed with Hitler’s Germany in March 1941. He and his band of like-minded soldiers took over the offices of the army and navy in Belgrade and supported the coup that brought Serbia firmly into the Allied camp. […] Vasovic learned for the first time that his father was arrested, jailed for four months and then placed under “house arrest” by German occupation forces, where he lived in fear of being sent off to a labor camp. Vasovic located this information in a secret report (sent to German envoy Victor von Herren in Belgrade) among the Nazi records now part of Serbia’s archive. However, access to the archives are restricted due to Serbian confidentiality and secrecy laws. Rather than going the full-Google and putting the results on the web for the world to see, hopeful archive readers are required to travel to a remote location in the Belgrade suburbs. Serbian citizens are required to submit an annual request to view the archives, while access to foreigners is limited to academic researchers who must apply through their country’s embassy or consulate. Concerns have also been expressed that the Serbian military has the capability to censor the archives.